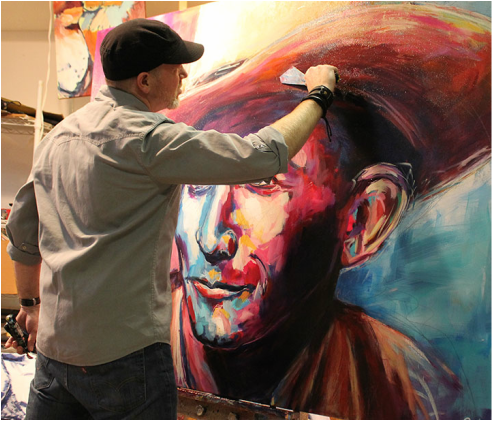 Roy's paintings employ a rough palette-knife style with blazing colors. They are remarkable, experimental, and exude Nashville." I grew up just outside of Nashville, Music City USA. I was raised in a household where I was always surrounded with music and taught to appreciate all genres. The musical influences of my childhood still inspire me today and can be seen in my artistic interpretation of vintage guitars, rock n' roll icons, and outlaw country legends. My art hangs in private collections here in the States and internationally. As I continue my evolution as an artist, I look forward to bringing my art to more galleries, homes, and businesses around the world. Numerous Commissioned works for corporations, businesses, private collectors and more. Live painting events are also a service I provide. Visit my Custom Art Page to learn more.